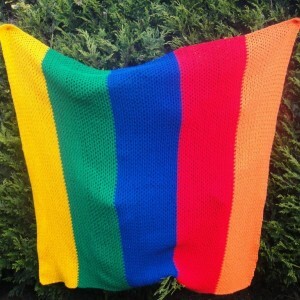 This Crochet Rainbow Blanket was the very first thing I made that Pieter approved of. The blanket is perfect for beginners. You don’t even have to know which loop belongs to which stitch. All you need to be able to do is poke your hook through the ch-1 spaces between stitches. It also grows ridiculously quickly. 500 g of double knit yarn (light worsted weight/#3) – one 100g ball should give you about 28-30 rows and you’ll need about 5 balls. I used Hayfield Bonus Dk in Sunflower, Emerald, Royal, Signal Red, and Bright Orange (in that order). Please Note: This yields a VERY loose blanket. If you want a more dense blanket, use chunky yarn and a 8 mm hook instead (US 11/L). US Terminology Used (US/UK comparison chart here). This pattern uses the linen stitch. You can find a photo tutorial for it HERE. If you want to make a smaller item using this stitch, consider making a Linen Stitch Dishcloth/Lovie. Make yourself very comfortable and START COUNTING. Sc in the top loop only of the fourth chain from the hook. *Ch 1, skip the next ch and sc in the next ch*. Repeat the instructions between asterisks until you get to the end of your chain. Ch 2 and turn. You will have half as many linen stitches (so *ch, sc* clusters) as the number of foundation chain stitches. Remember that the ch-2 turn counts as one linen stitch. Sc in the first ch-1 space. To do this, insert your hook under the ch st between the first 2 sc’s and make a sc. *Ch, sc in the next ch-1 space*. Repeat instructions between asterisks until you get to the end of the round. Remember that the turning ch-2 counts as a linen stitch and should be worked into. Ch 2 and turn. When you get to the end of the last row, ch 1 and bind off. Work away your tails of yarn. You can change colours as often as you like. I changed colours every 30 rows (ish). More accurately, I changed colour when my yarn ran out. Kind of respoding to your later post…..Also known as “lattice stitch” but prefer the linen stitch. This is my favorite go -to crochet pattern for quickie dish cloths for gifts for my friends who appreciate the value of a well made dish cloth or a baby bib (just add straps!) Use an H or K hook and worsted weight cotton. Your first attempt is a winner! Keep it up, Giiiiirrrrrrrrrl! Hola Dedri. Soy muy mala para las explicaciones, por ésto, te agradecería si pudieras enviarme el gráfico de ésta manta. Gotta love this gal and this site!!! Super proud of you.